ONE SHEET ORIGINAL MOVIE POSTER. CONDITION: NEAR MINT C9. LINEN BACKED READY FOR FRAMING. NATIONAL SCREEN SERVICE (NSS) ISSUED. FIRST PRINTING NSS # 77/21-0. All photos shown are of the actual poster for sale. If it has any minor defects like pin holes, creases, etc. And they are not mentioned, they should be visible in the high resolution photo. Perfect for a high end home theater. Highly sought after by movie poster collectors and aficionados. Always seeking quality consignments. Immediate cash advances available. Lieberman is the owner and founder of CineMasterpieces. David is a recurring expert featured on The History Channel TV show Pawn Stars. From the CineMasterpieces archive. This is a genuine 27″ x 41″ U. One sheet ORIGINAL MOVIE POSTER issued by the studio when the film was released and meant for theatrical display. National Screen Service (NSS) issued. First printing NSS #77/21-0. The style A one sheet was printed at least 4 times in 1977. This version with NSS # 77/21-0 is the first printing. This one always commands a premium over the other versions. There are known reprints and/or reproductions of this poster. THIS IS NOT ONE OF THEM! This is guaranteed to be a genuine ORIGINAL MOVIE POSTER issued by the studio when the film was first released and meant for theatrical display. We are absolutely certain it is authentic. Bootlegs have a “hair” on Luke’s belt area. This does not have the hair. This is the most bootlegged and reproduced poster on planet Earth! It is extremely difficult to find an authentic one. About half the ones sent to us for consignment have to be sent back because they are reproductions. Comes with a Certificate of Authenticity. Prior to Linen Backing this poster was folded as issued. These can be very difficult to find in any condition! A long time can go by without one of these coming up for sale. Typical minimal fold line touch up. A Linen Backed poster is a poster that is archivally mounted to acid-free paper and canvas where it can be restored if needed. Fold lines and other defects become less noticeable, sometimes even invisible. Linen Backing can dramatically improve the overall appearance of a poster and it can substantially increase its value. It is the preferred archival method for conserving and/or restoring a poster. There are known reprints and / or reproductions of this poster. This is NOT a reprint or reproduction poster! It is guaranteed to be a REAL ORIGINAL MOVIE POSTER issued by the studio when the film was released and meant for theatrical display. Please read all of the information below before purchasing. Please be advised that over 95% of all Original Movie Posters printed before the mid 1980′s were issued FOLDED. This is NOT considered a defect. Vintage rolled posters do exist, however they are extremely rare. We can have any folded poster Linen Backed which will make the fold lines virtually disappear. Also please note that most movie posters were actually used at the theater, and some will contain slight imperfections such as: writing on the back, pin holes, fold wear, small tears, etc. These are all very common and to be expected, but if they bother you, all these minor flaws can be remedied in the Linen Backing process. Linen Backing preserves and can actually increase the value of a poster. For the most part, any flaws will be fixed and the poster will appear to be in Near Mint condition. We do not always measure all of our posters exactly. Unless otherwise specified, poster measurements quoted above are approximate to the nearest inch. For example, if we say a one sheet poster is 27″ x 41″ its precise measurements may be closer to 26 3/4″ x 40 7/8″ (or something similar). This slight variance is quite common for all original movie posters. BEWARE OF “FAKE” MOVIE POSTERS! There are fakes, bootlegs, reprints, and reproductions of almost every popular movie poster. WE DO NOT SELL THESE AS ORIGINALS LIKE OTHERS DO! There are many unscrupulous dealers who successfully pass off these posters as originals. They have been doing it for years! These fakes are almost indistinguishable from originals, only experts can tell. They only discover years later when they sell them that they are worthless. Most are from popular movies from the 70′s and 80s, but there are also really old ones and relatively new ones as well. They usually appear in insert size 14″ x 36″ and one sheet size 27″ x 41″. Again, all we can say is BEWARE! We grade our posters according to the Iguide Universal 10-Point Movie Poster Grading Scale. Almost all of our inventory is graded at least C8 Excellent or better. C10 Mint – Investment quality. No perceptible flaws of any kind. C9 Near Mint – Investment quality. Minor flaw on an otherwise unused poster. C8 Excellent – Investment quality. A few minor defects. Pin holes, small tears, etc. C7 Very Good to Excellent – Fine. Still a very nicely preserved item. C6 Very Good – The typical used poster in average condition. C5 Good to Very Good – A heavily-worn item. C4 Good – Below average but still suitable for display. C3 Fair – Heavily worn, but yet still complete. C2 Poor to Fair – An extremely worn, possibly even incomplete item. C1 Poor – The lowest grade, representing items in the lowest possible condition. Some of our posters are “between grades”. For example, a C8-C9 poster will contain all the qualities/characteristics of a Near Mint C9 except for one or two very minor flaws that we believe prevent it from being a true C9. Sometimes it isn’t possible to do this. Sometimes we can’t roll a folded poster. We only use the strongest packaging materials available. Rolled posters are put into a plastic sleeve and then placed in a HEAVY-DUTY thick walled 3″ or 4″ diameter plastic tube. We roll the poster into a smaller diameter than the tube. This is VERY IMPORTANT because it gives the edges strength and helps to prevent them from getting wrinkled. We add soft cushioning material on the ends to prevent them from getting damaged. We stamp FRAGILE: DO NOT BEND on the outside of the package. You must notify us before sending it back. Let us sell your posters for you! We guarantee that all posters we sell are graded and described accurately. Unless otherwise specified in the description, all posters are original theatrical movie posters that were displayed (gently used) or meant for display (unused) in theaters at the time the movies were released. We will put in writing that we guarantee it to be an original movie poster. 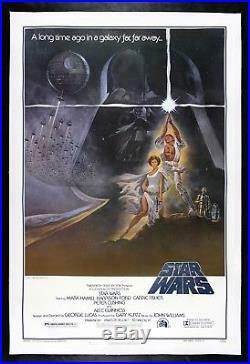 The item “STAR WARS CineMasterpieces 1977 VINTAGE NSS 77/21-0 ORIGINAL MOVIE POSTER” is in sale since Thursday, September 27, 2018. This item is in the category “Entertainment Memorabilia\Movie Memorabilia\Posters\Originals-United States\1970-79″. The seller is “cinemasterpieces” and is located in Scottsdale, Arizona. This item can be shipped worldwide. This entry was posted in star and tagged 7721-0, cinemasterpieces, movie, original, poster, star, vintage, wars. Bookmark the permalink.